The Twin Cities area offers refuge for many immigrant groups from around the globe escaping social and political problems in their homelands. One such group is the Oromo people from Ethiopia. One of the largest populations of Ethiopian immigrants in the United States has settled in the Twin Cities metro area. The varied cultures and disparate groups from the eastern African nation make national identity a complex and touchy issue. The Oromo find fertile ground in the Twin Cities for speaking out against claims of human rights abuses in their homeland. Meanwhile, relationships with fellow Ethiopian immigrants remain strained because of a long history of political differences. Minneapolis, Minn. — The sycamore tree is an important symbol for people who come from the Oromia region of Ethiopia. Its broad limbs and green canopy serve as a town square of sorts. It's a meeting place and a signpost in the landscape. Oromo people put pictures of sycamores on their walls, on calendars and even on the flag for their political movement. The tree isn't native to Minnesota, but the Oromo Center in Minneapolis' Cedar-Riverside area could serve the same purpose for the immigrants who live here. Oromo elders sit on chairs against the walls of a small front office space. The walls are covered with pictures, many of graduating Oromo students receiving diplomas and other awards. Hassan Hussein has been an active volunteer at the Oromo Center since he first arrived in the Twin Cities in 1994. The U.S. offers freedoms Hussein said are not available in his country. "Back home in Oromia, the mere act of expressing a political opinion could get you in prison for years," Hussein said. "There are people who have been in prison for like 15-20 years never being brought before a judge or a court, simply for expressing their views. Being Oromo here you can organize openly, you don't have to hide." Hussein is Head of Foreign Relations for the Oromo Liberation Front (OLF), a militant opposition group formed in the 1970s after more than a century of oppression of Oromo people. The OLF is seen by the current ruling government of Ethiopia as an unlawful organization. Others say the government's claims are exaggerated to justify brutal security measures. Either way, some people say the OLF offers the best hope for some sort of unified government there. Hussein hopes the ability to speak freely in America can help generate support for the Oromo cause. "You can develop your language, nobody looks at you as a threat," Hussein said. "So it is a lot easier to be Oromo here in Minneapolis than in Oromia." The state demographer's office estimates there are about 7,500 immigrants from Ethiopia in Minnesota. Immigrant groups say the number is double that. 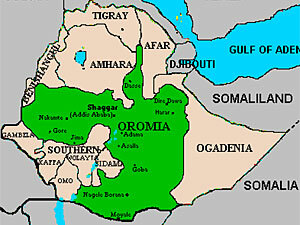 About half the Oromo population, both in Ethiopia and the United States, is Muslim. The rest are mainly Christian. Two Minneapolis churches offer Oromo language services. At Bethany Lutheran Church on Franklin Ave., singer Tirfe Guteta warms up the crowd with a 20-minute song and prayer session as the Sunday evening sun came through the traditional stained glass windows. About 300 people in the pews stand and sway, clasp their hands, weep and sing with religious devotion. A spicy mixture of smells waft in from food prepared in the downstairs kitchen. It's unlikely any Ethiopians other than Oromos are at this church service. The history of strife in their homeland translates to a loose self-segregation here in their adopted country. There are dozens of different ethnic separations in Ethiopia, based largely on language and cultural differences. While the average Minnesotan may not know the national origin of their coffee shop owner, the different Ethiopian ethnic groups often patronize restaurants, coffee shops or stores depending on the ethnic identity of the proprietor. Robsan Etana is a member of the Oromo Citizens Council centered in St. Paul. Among other things, the three-year-old organization started an effort with the Advocates for Human Rights to document stories by Twin Cities Oromos of abuses in Ethiopia. "These people are just political prisoners," Etana said. "They did not commit any crime. They just didn't want to endorse this regime's oppressive agenda." Etana said many Oromo immigrants in the U.S. still have friends and family in Ethiopia, and so the ties are strong. But like many people who land in the American melting pot, they find the ability to hold on to vital cultural links weakens with every generation. "For me, my culture is still my culture," Etana said. "But for second generation Oromos, you come to America, you go to American school, and the language is probably not going to die -- but it gets mixed with mainstream American language. That's our worry." Ahmed Wassie has lived in the U.S. since 1973. He is ethnically Amharic, not Oromo. He supports the Oromo people's right to live freely and participate in the Ethiopian government. But he doesn't understand why many Oromos and others in America put ethnic differences ahead of the greater good of the country. "They don't fight. You don't see name-calling," Wassie said. "You don't see fistfights in neighborhoods or something. But you see cold shoulders. People not speaking to somebody who speaks Amharic if you are an Oromo. Most Oromos, for example don't care whether they speak to an Amharic speaker. That always shocks me." Wassie hosts a weekly talk program on KFAI-FM radio called "Voice of Ethiopia," where he said he sometimes tries to bring each side together to arrive at common solutions. Solomon Gashaw, an associate professor of sociology at the University of Minnesota, Morris, grew up in the Oromia region but does not consider himself Oromo. He left Ethiopia in 1977. He is hopeful the ethnic differences won't always be such an obstacle. Gashaw said immigrant life in America sometimes has a way of tempering differences, as people from divergent backgrounds live and work near one another. "As an immigrant you'll be sometimes forced to work in the same industry, factory and so on," Gashaw said. "There is cordial relations. Generally people are polite." Gashaw said many Ethiopians in the U.S. retain hope of someday returning to their homeland. But after more than 30 years of political unrest, most have developed quiet, productive lives in America.